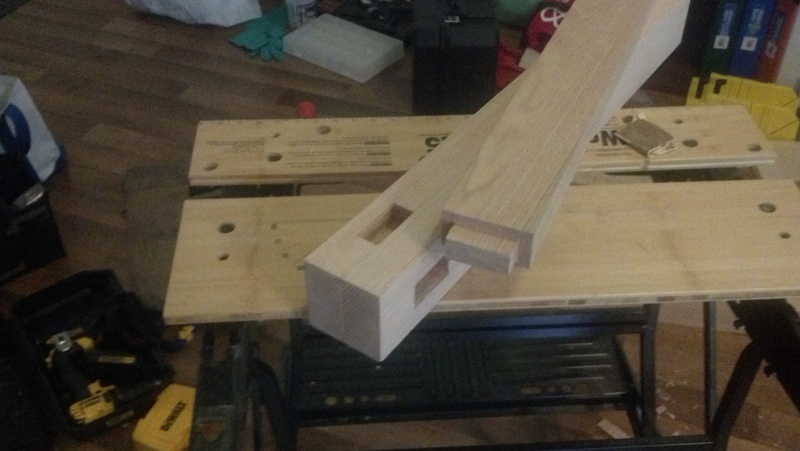 Mortise and Tenon joint is the first woodworking joint I learned to cut. At first, it was tenons by hand and mortises by plunge router. Closed mortises, roughly half the material deep, and stub tenons, with four shoulders. Everything co-planar and nothing fancy. Words like “reveal” and “haunch” were unknown to me. One of the first joints I ever cut. Even the picture is poor quality. After a few months of voraciously consuming woodworking scholarship (mostly via YouTube) and much trial and error, I knew enough to plan a specific reveal for a joint. A nice roundover leading to a slight reveal can make a world of aesthetic difference and can be accomplished by simply varying tenon shoulder depth. 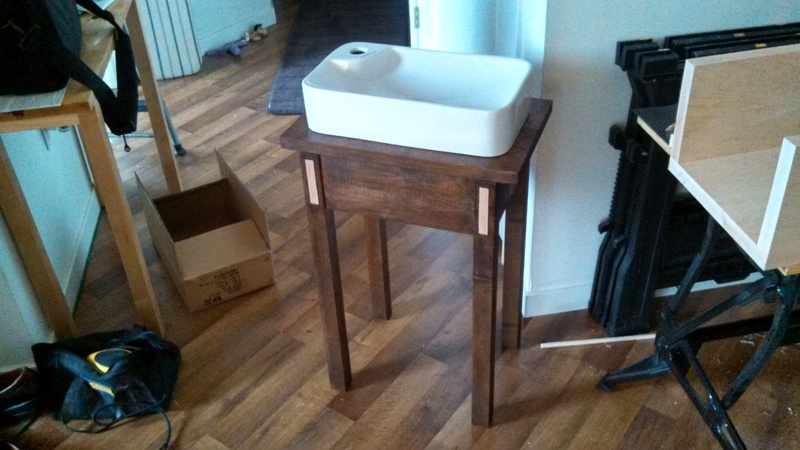 The vanity sink I built for my brother’s first house. That’s the matching footstool on the right. 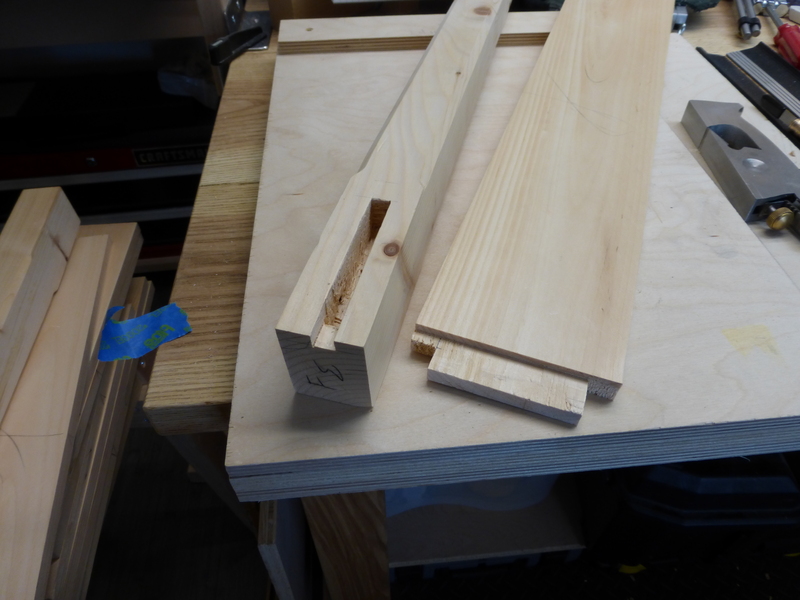 Later, I learned to always cut mortise and tenon joints to align the long-grain gluing surfaces (and maybe even do a double mortise and tenon) for maximum strength. This allows for different board orientations (and more delicate-looking frames). Later still, I discovered the haunched tenon, and I’ve been using it as much as I can ever since. This is the angled-leg bedside table. I understand the true purpose of the haunch. It permits maximum tenon height (for maximum resistance to twisting force) while still keeping the mortise closed at the top (and thereby stronger than an open mortise, such as a bridal joint). But I also appreciate the economy of the joint. The haunch means I have to chop less mortise overall without compromising joint strength. On a rectangular table with eight mortises (of 4 inches or so each), a half inch haunch saves me a full mortise-worth of chopping. I also rarely do full length tenons, preferring a bottom shoulder of some depth (usually the width of the mortise, because a chisel is a handy straightedge) to hide any roughness of the mortise hole. Assuming a bottom shoulder of another half inch, that’s a whole extra mortise worth of chopping saved in a single project. And with the haunch on the top of the tenon, I’m only cutting three shoulders – maybe even only two shoulders, if the material is thin enough. All this time savings means I get more done in the shop with less effort. And best of all, none of these “shortcuts” ever show in the finished piece.